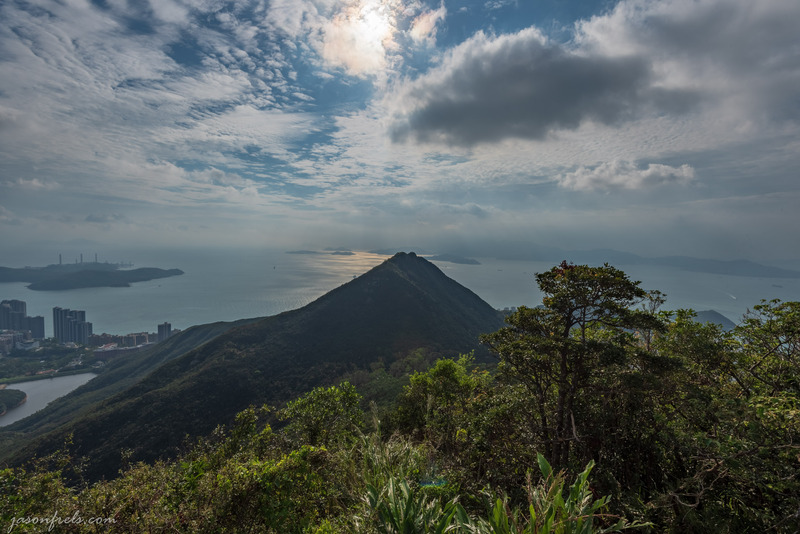 On Saturday in Hong Kong, I wanted to take an easier day than the one before on Lamma Island. 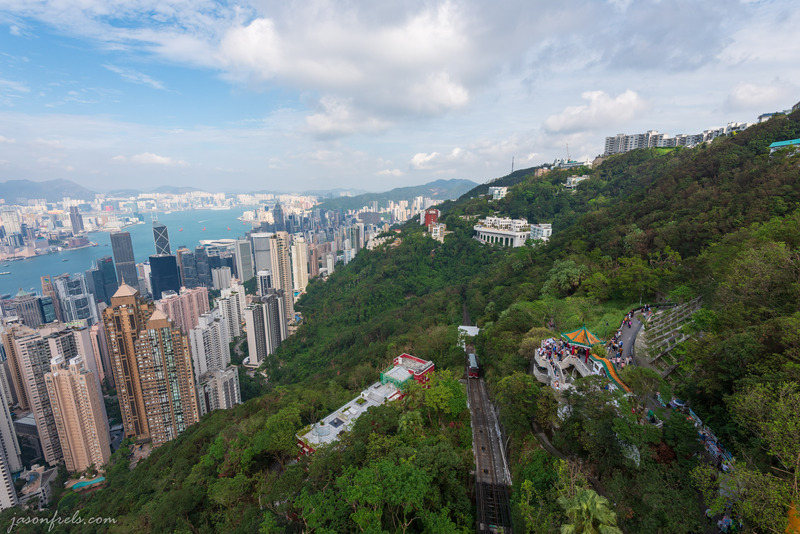 I decided to take the tram to Victoria Peak and hike around and enjoy the view. I did this a few years ago on a long layover, but I had more time on this trip and wanted to walk around a bit more and see the sights. The line at the tram station was incredibly long, but I waited and eventually made it to the tram. Below is a photo of the tram nearing the top. 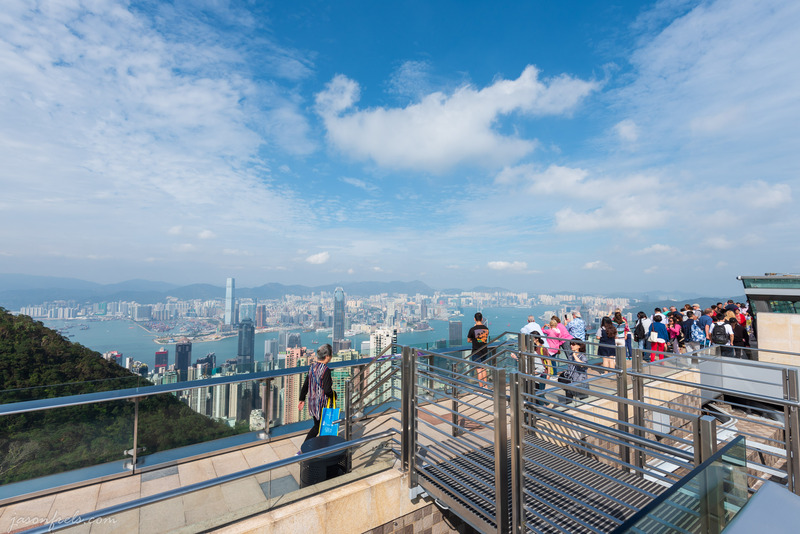 Once you get to the top train station, you can take a series of escalators up to an observation deck that overlooks Hong Kong. It was a bit crowded with people enjoying the view, but I was patient and got the photos that I was trying to take. It was a relatively clear day for a change, so the sky wasn’t a gray mess. You can see Hong Kong clearly and Kowloon in the distance. I took a photo of downtown at 16mm and then a panorama stitch at 24mm to see what would turn out better. Below is a panorama stitch of 5 photos shot at 24mm. From here I hiked up to Victoria Peak Garden. This was an uphill hike most of the way on sometimes narrow roads. There is an overlook facing West at this point. I took the following photo as a series of bracketed photos to HDR merge later. I am not completely happy with the way the merge came out. All of the haze in the air didn’t really come out well. It may have been nice to hang out here until sunset. Later that evening, I took the subway to Kowloon and went down near the Avenue of Stars in hopes to see the light and music show that I had read about. 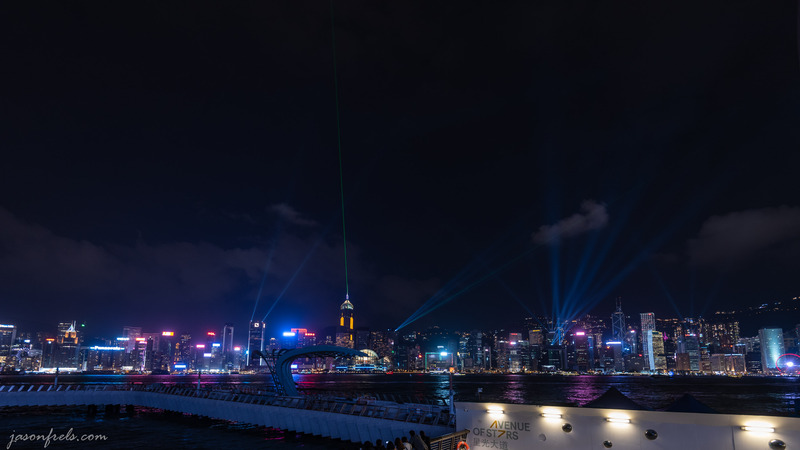 In the evening, several of the building in Hong Kong have laser projectors that put on a show. There is music to go with it, but from where I was, I didn’t hear any music. I got there early enough to set up my tripod and took some practice shots. Below is one of the photos that I took with the lights across the sky. I was a bit unimpressed with the light show. Perhaps if I had heard the music, it would have been different. It was quite a bit of effort to get there and very crowded, but if I hadn’t gone, I probably would have regretted it. To get around, I purchased a tourist pass for the trains and subways. This was not very expensive HK$65 (about US$8.31). I could walk to the subway station from my hotel in about 10 minutes and take subways around town. To get from my hotel to the avenue of the stars for the light show, I had to switch subways once to get on a different line, but it was not much trouble. The signs are easy to follow. The next day I had to head out to Malaysia for work, but I had a nice sight-seeing visit to Hong Kong for a few days. Thanks for reading. 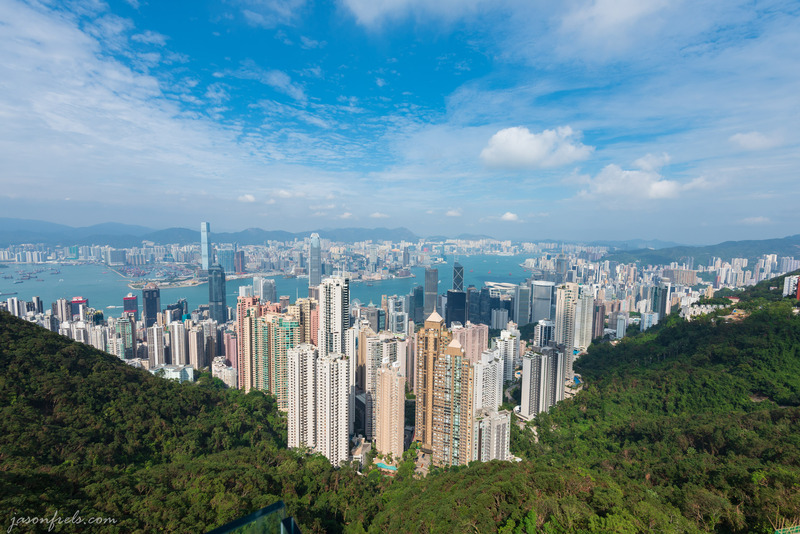 Is Victoria Peak open at night? It could make for some interesting photos. I think you can be up there at night. The problem is the almost constant haze.